TEL AVIV, Israel (CNN) -- A suicide bomber blew himself up in a crowded Tel Aviv outdoor cafe Friday, killing at least three other people and injuring more than 40 others. Many patrons were dressed in costumes to celebrate the Jewish holiday of Purim. The militant Islamic group Hamas claimed responsibility for the attack. 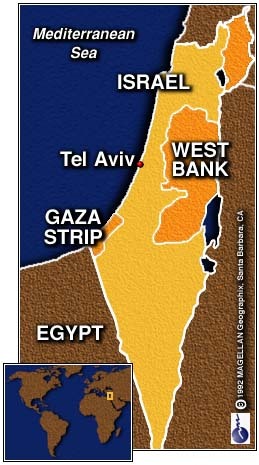 Israel immediately sealed the West Bank and Gaza Strip, barring all Palestinians from entering Israel. The death toll rose to four after an injured woman died at Tel Aviv's Ichilov hospital, a hospital spokeswoman said. Two other Israeli women died at the scene. Among the injured was a 6-month-old baby, who was burned over a large portion of his body, authorities said. The bomb was studded with nails for more deadliness. A caller to Israeli Radio who claimed to represent Hamas said the Islamic fundamentalist group was behind the attack. Police received a similar call. Palestinian Authority President Yasser Arafat condemned the explosion, the first after a yearlong lull in suicide bombings. Arafat called Israeli Prime Minister Benjamin Netanyahu and Israeli President Ezer Weizman to express his condolences. Authorities said it appeared from the disfigurement of one of the bodies that the suicide bomber entered the cafe with explosives strapped to him. Pieces of chairs and tables and shards of glass littered the street. A waiter at the Apropo Coffee House on Ben Gurion Boulevard, a main thoroughfare in downtown Tel Aviv, said he saw a suspicious man walking around on the cafe's patio carrying two bags. "He looked strange," waiter Gad Ben-Tzur told The Associated Press. "I was trying to pick up an order. A second later, there was a tremendous flash and he blew up." The explosion could be heard throughout the city, which was crowded with costumed people celebrating the holiday of Purim that began Thursday night. During last year's holiday, a suicide bomb at Tel Aviv's Dizengoff Center shopping mall killed 13 Israelis, many of them children. The attack came at a time of high alert. Israeli security forces had warned of possible terrorist attacks after Israel began construction this week on a controversial housing project in predominately Arab East Jerusalem. Palestinian officials, including Arafat, strongly opposed the construction but urged followers not to resort to violent protests. 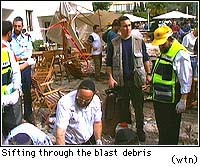 Israeli government spokesman Moshe Fogel accused the Palestinian Authority of giving "a green light" for Friday's blast. "I think it is totally unacceptable to have civilians being held ransom in the political process," Fogel told CNN. "We want to make peace but we are not willing to commit suicide." Palestinian Council member Hanan Ashrawi expressed sorrow over the bombing. "It is indeed sad to see Israeli civilians becoming victims of the volatile situation, and we hope that the violence will stop." She denounced Israeli accusations that Arafat had provoked the attack by releasing accused terrorists from prisons. "That is entirely untrue," Ashrawi said. "The Palestinian Authority has done everything possible ... to keep the situation calm and to prevent violence. But when asked if there was still a peace process with Israel, she replied: "It is very, very hard to tell if there is one. It is on its dying bed." "We have been pushed to this situation by the positions of Prime Minister Netanyahu," said Marwan Kanafani, a spokesman for Arafat. Asked if he meant the groundbreaking in East Jerusalem, Kanafani said, "Yes." He denied that the Palestinian Authority had released any terrorists from prison and said the allegation that the authority encouraged terrorism was "nonsense." Netanyahu, who rushed to the scene after meeting with his senior advisers, said the peace process and the goal of ending terrorism should remain separate issues from the Israel housing project. "The peace process is threatened not by the periodic disagreements, but by the mentality that says that if we have a disagreement we can go and blow them up," Netanyahu said. "It is threatened by the idea that violence is sanctioned despite negotiations, that you can kill women and kids in a cafe. All the attempts to explain this away, they are a threat to the peace process," he said. "So I would advise the international community to do the right thing, and that is for them to understand nothing justifies terrorism." The explosion occurred about 1:45 p.m. (1145 GMT), just yards away from City Hall. One witness said about 20 or 30 people were near the bomber when the explosion went off. Police helicopters circled above the scene and police dogs searched neighboring buildings to see whether more bombs had been planted. Meanwhile, in the West Bank town of Nablus, Hamed Bitawi, a Hamas leader, told more than 10,000 supporters during a rally, "I have good news for you. There is a suicide operation in Tel Aviv." The crowd clapped and responded with shouts of "Allahu Akbar," or God is Great. "This is the only language the occupiers understand, the language of martyrdom," Bitawi said.